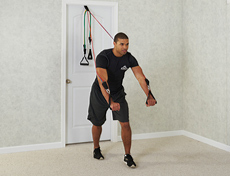 Grab handles with both hands and step on middle of band with R foot. Step L foot out in front for a comfortable stance and lunge slightly forward. Bring both elbows up and forward so that the upper arms are lined up with your ears, close to your head. Inhale and release slowly to start position. 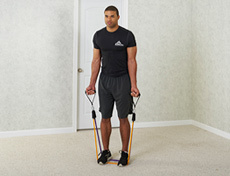 Place the middle of band under both feet and hold handles by your sides. With feet hip distance apart, stand tall and keep core engaged. 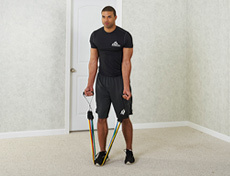 To decrease intensity, use a single band under both feet. To start, take a deep breath, exhale and raise your hands up towards your shoulders. Keep elbows under shoulders through movement. 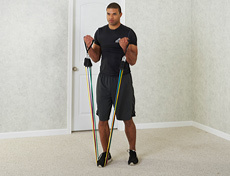 Place the middle of stacked bands under both feet, and hold both handles by sides. With feet hip distance apart, stand tall and keep core engaged. 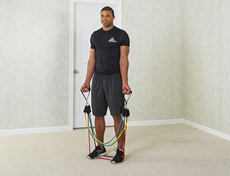 To decrease the intensity, place fewer bands underneath feet. To start, take a deep breath in, exhale and raise your hands up to shoulders. Keep elbows under shoulders throughout movement. Face away from the door and grab handles with both hands. Step away from the door 1-2 feet, with one foot behind the other for a comfortable staggered stance. Stand tall with core engaged. Extend arms out to sides at shoulder height, elbows slightly bent, and palms facing forward. To start, take a deep breath and exhale as you bring your arms together in front. 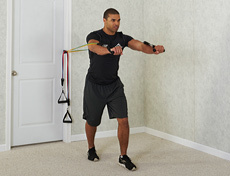 Inhale and slowly release the band by extending arms and chest muscles, so the band is back in start position. 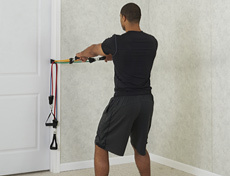 Facing away from door, grab both handles in each hand. Step away from door 1-2 feet, with one foot behind the other in a staggered stance. Lift elbows back so that hands are just below shoulder height, elbows are completely bent, palms faced down. Stand tall with core engaged. Inhale and slowly return to start position, with elbows pulled back. 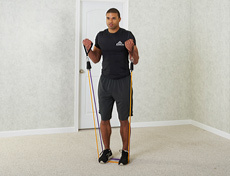 Place middle of the stacked bands under one foot, keeping them hip distance apart, holding both handles by sides. Keeping elbows pinned to your sides, stand tall, engage core, and raise hands up towards shoulders. 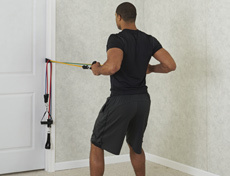 Place middle of stacked bands under both feet, keeping them hip distance apart, and hold both handles by sides. 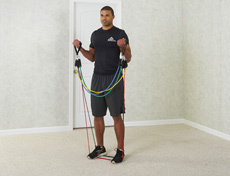 To decrease the intensity, use fewer bands. Keeping elbows pinned to sides, stand tall, engage your core and raise hands up towards shoulders. Face away from door and grab handles, one in each hand. Step 1-2 feet away from door, one foot behind the other in a staggered stance. Lift elbows until completely bent and pointing back, with hands lower than shoulder height, palms faced down. Stand with torso slightly forward and core engaged. To start, take a deep breath, then exhale and press both arms at a downward angle, till arms fully extend. 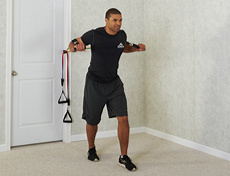 Place middle of band under both feet, and hold handles in each hand by your sides. Stand with feet hip distance apart, keeping back straight, core fully engaged, and arms straight. To start, take a deep breath, then exhale and raise your straight arms upwards until they reach shoulder height. Insert anchor near bottom of door. Face away from the door and grab the handles, one in each hand by your sides. Step 1-2 feet away from door, standing with feet hip distance apart. Stand tall with back straight, core fully engaged, arms straight. Inhale and slowly return to start position.